In Edinburgh, McGlashan was heavily involved in the Free Church of Scotland. This, in turn, saw him become involved in the promotion and logistics of the Otago Settlement Scheme by Scottish and English immigrants. In 1853, after emigrating to Dunedin himself with his wife, Isabella McEwan, and eight children, McGlashan was soon ensconced in the town’s political circles and religious community. He worked closely with the Reverend Dr Thomas Burns and was instrumental in the building of First Church. It is no surprise, then, that religious volumes, like this one, are part of the McGlashan Collection. ___, “Family Worship. 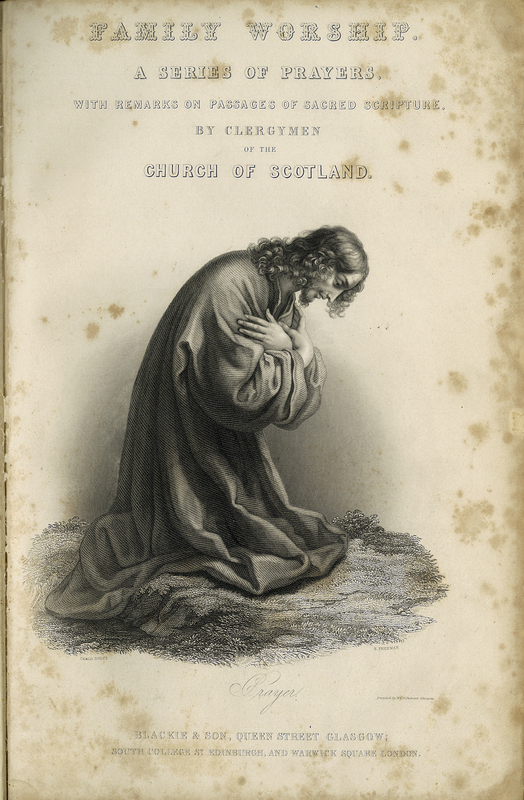 A Series of Prayers, with Remarks on Passages of Sacred Scripture by Clergymen of the Church of Scotland,” ourheritage.ac.nz | OUR Heritage, accessed April 20, 2019, http://ourheritage.ac.nz/items/show/11210.